I’ve been in denial for a long time and it could prevent me from hiking with my dog. The first step is admitting you have a problem. I have plantar fasciitis. Two summers ago I made a terrible mistake. It was early in the hiking season and I was itching to get out. I finally had some time and motivation so I packed up everything, including my favorite hiking boots, and headed to a new-to-us trail with Gretel. When I got to the trailhead, I realized my hiking shoes didn’t have my supportive insoles in them. In fact, they had NO insoles. I wasn’t about to call it a day and drive for 2 hours back home. I had been wearing my barefoot sandals a lot recently and thought, “How much different could hiking in boots with no insoles be?” It couldn’t be that bad. We headed off down the trail and had a great hike. My feet felt fine… until I got back home. They actually didn’t even feel bad that night, but over the next couple of days I developed a pain in my heels – the front part closest to the arch. Thinking I just bruised my feet on the hard footbed of the shoes, I ignored the pain and thought it would go away. By the time a few weeks went by, I had developed a “tearing” pain in the arch of my foot. That’s the only way I can describe it. It felt like there was a non-stretchy rope attached from the heel to the ball of my foot. When I would get up in the morning, sometimes it would feel like this non-stretchy rope was being pulled apart and was tearing a little. This pain, too, was periodic at first. I continued to hike all summer, my foot pain became more frequent, and I started to suspect I had plantar fasciitis IN BOTH FEET! I did some basic research. WebMD said, “The plantar fascia is the flat band of tissue (ligament) that connects your heel bone to your toes. It supports the arch of your foot. If you strain your plantar fascia, it gets weak, swollen, and irritated (inflamed). Then your heel or the bottom of your foot hurts when you stand or walk.” Yep, that’s what was happening to me. Exactly. I eventually decided to do something about it. Going to the doctor for a diagnosis was not one of them. I knew they would just tell me to stop hiking for a while and I don’t see that as an option for me. However, my acupuncturist said, “Oh, Jessica. 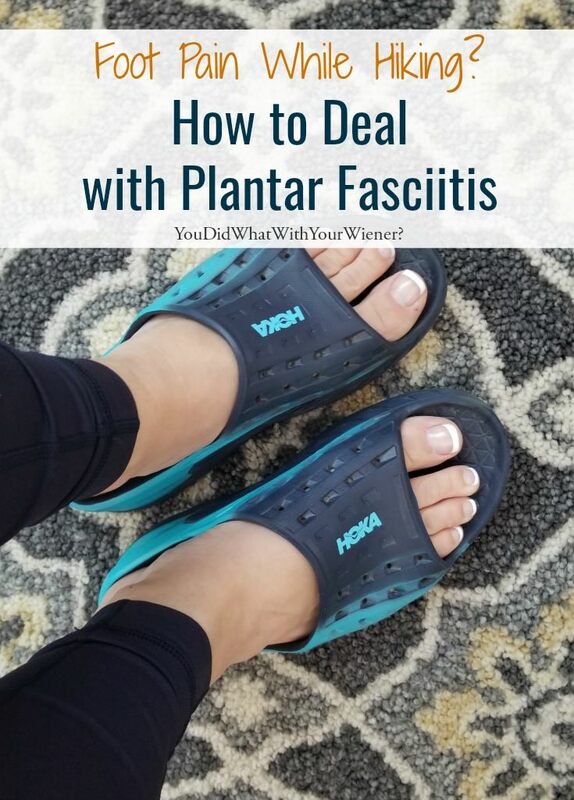 Yes, you have plantar fasciitis. Very bad.” so I guess I WAS officially diagnosed. I needed to find a way to manage my foot issue so I could continue to hike with Gretel. I’m probably still in denial and being less than smart about this issue. I don’t think I’m ignoring it though. Not exactly. I did what every person does nowadays – I Googled the heck out of it! Trends emerged and I started doing all of the recommended home treatments. I’m definitely hoping that, with management, it will get better or at least never get worse. So, how am I managing my foot pain? What’s known to work for this kind of issue? Note: Some of the links below are affiliate links, which means that I get a few pennies if you make a purchase, at no extra cost to you, to help support this blog (and we really, really appreciate it!). Some are links to stuff I bought myself and some are to products I’ve received a discount on. I’m sharing all of the items below only because they have been the best way to manage my condition. Of course, there are always supplements and medication to help inflammation. While I’ve taken a Turmeric/Curcumin supplement for several years to help various issues, I am not above taking some ibuprofen after a hike or long walk. It’s very important to wear the right shoes. I no longer have the luxury of choosing shoes based on looks alone. I have medium-high arches so, first and foremost, they need to have great arch support. They also can’t be restrictive. They need to allow my toes to spread out naturally as I walk. I’m wearing only my HOKA ONE ONE Bondi 5 running shoes when I’m walking the dogs on pavement or running errands. The midsoles are twice the thickness of other running shoes so they have excellent shock absorption. They have a low heel-to-toe drop (the difference in height from heel to toe of the shoe), which encourages a natural walking and running gait. The active foot frame offers excellent arch support. I’m also wearing only supportive sandals and have replaced all of my dressier shoes with still-dressy-but-comfort-priority versions. I’ve read that going barefoot BEFORE you have plantar faciitis can help prevent it but going sans-shoes if you are experiencing problems is not a good idea. That has been my experience too – it seems to hurt more after I walk around barefoot in the house for a while. Instead, I’ve been wearing the HOKA ONE ONE ORA Recovery Slide. The sandals are basically just the cushy, oversized midsole from the HOKA running shoes strapped to the bottom of my feet (but without the restricting fabric of a full shoe). The sandals offer my foot enough support while allowing my feet to breathe and stretch out naturally. I can’t and don’t want to replace all my hiking boots so I’m using super-supportive insoles. I’ve always used insoles in my shoes but my old standby was no longer good enough. The key to finding the best insoles is finding the proper arch support for your feet combined with some cushioning. In my case, I have higher arches so I had to find insoles with, basically, the highest arch support I could find. I tried several brands and styles to see what worked. For now, I have settled on Icebug FAT High Arch, Max Cushioning insoles (they also come in medium and low arch). The “FAT” means they have an extra layer of memory foam for more comfort and protection. The Double-Arc heel design cups the foot and reduces pressure on the plantar fascia. 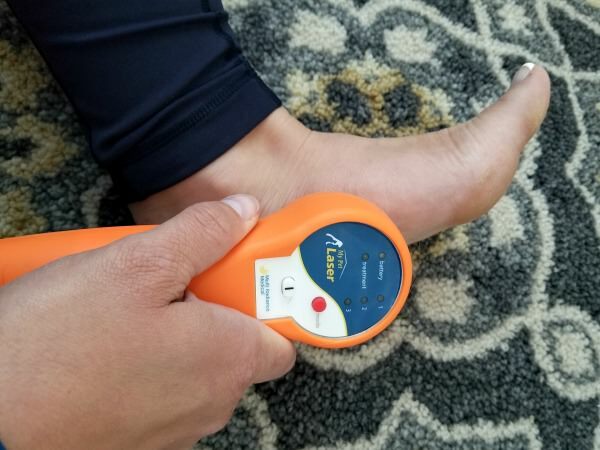 The part that makes my feet go “ahh” is something I haven’t seen in insoles before – a little “ArchFlexSystem®” bump right underneath the ball of my foot that helps my foot stretch out a little there. I’ve had acupuncture treatments on my feet and that definitely helped. I’ve been seeing this really great Chinese doctor for years and he was able to significantly reduce my pain with 4 treatments. I’ve also been using the My Pet Laser (cold laser) I got for Gretel on my own feet. Although that is considered “off label” or “unapproved use” use of it because it’s marketed for pets, it’s very, very similar to the version of the laser for humans. I’ve been using it daily and I have noticed less issues with my feet. With all of these treatments and preventative measures, I do feel like I’ve successfully learned to manage my plantar fasciitis. It definitely hasn’t gone away but I am happy to settle for it not getting any worse. There is nothing more I like in this world than hiking with Gretel and I don’t want to have to stop. Have you dealt with chronic foot pain? How did you handle it? The thing that helped me the most was wearing a night splint this made a big difference from almost the first night . I also have orthotics made for me and try to do stretches. Bearing in mind I hike a lot with my dog and stand with my job for up to 10 hours a day as a pharmacist I can’t praise night splits enough. I bought mine on eBay for about £20 . I’ve definitely seen the night splints around. I can’t sleep with socks on though so I don’t know how I would do with that. I’m not desperate enough at this point to try them but I will certainly keep them in mind. Ugh…I’m sorry you’re having foot pain. I’ve heard plantar fasciitis is extremely painful. I’m not a hiker like you, but I play ice hockey a couple times a week so whenever I have an injury I try to play through it. Unfortunately, I suffer from gout and it seems to flare up without notice. I think it’s usually stress related, but they say it’s from eating rich foods like shell fish, red meat, etc. To give you an idea of how painful gout is my dad who also suffer from gout cut off half of his finger in a construction accident and said it was less painful than a gout flare up. Luckily I found some medications that help with flare ups and I’ve learned to manage the pain, but every once in a while I have to take a few days/weeks off from fun time. I hope you’re plantar fasciitis gets better soon. I actually didn’t know there was surgical option. That’s great to know. My management routine is going pretty well but I expect that it may stop working someday. Good to know there is another option and that it was a success for your husband. Sorry to hear you’ve been dealing with this. Given your love of hiking, I’m sure the physical pain may not even be the worst part compared with the fear of losing a hobby. Both my father and brother-in-law have had PF and made a full recovery and returned to all their normal activities. They did a regimen the looks very similar to what you’re doing. So I hope you find it encouraging and keep taking good care of yourself. Yeah, that’s definitely it… fear of not being able to hike for long distances anymore. I’ve suffered with back pain for years and hiking is the only really rigorous thing I can do with minimal issues. It’s encouraging hear that a management routine worked for family members. I do actually feel like mine has been getting better. I’m having less issues now than I had in the beginning (despite not being totally consistent with my management routine). I used to walk 5 miles daily with my two dogs. And I was careful about trying to wear the best shoes, but still developed a toe problem. Now, it has me down to only a half-mile on a graveled wooded path; cannot do pavement, due to knee issues. Very important, although I always thought I’d worn non-restrictive shoes. I developed a bunion/first toe issue. At some point, I am going to have to have surgery to correct that, just keep putting it off. It may have a hereditary factor since my mother and other relatives have had this (especially the big toe slanting over the second toe). I’d say always be very, very careful with your feet.We tend to take them for granted until a problem develops! One of my good friends has bunion issues. I know how much trouble it can be. It’s true about our feet… that we take them for granted. Once you have an issue though, you realize that EVERYTHING stems from your feet (no pun intended). Need to stay in shape so extra weight doesn’t cause health issues and joint pain? You need working feet for that. Foot problems can cause you to stand in weird positions which then affects all of your joins negatively. I’m sure you know this though. Good luck to you. Foot issues are a real bummer. I ran into the same problem a few years back. At one point I had a steroid shot in 1 foot because of the constant pain & the effect the limping was having on the rest of me. I found a Feldenkrais Practitioner that helped tremendously and she encouraged me to see a foot dr . He directed me to use small pads in my shoes in certain areas that helped take the strain off the ligaments. Also, rolling the ice bottles, ibuprofen, Tumeric and Glucosamine with MSM & my ND offered Wobenzym N, all for joint health & inflammation. I also cut back on walking for awhile & no aerobics. My feet are great now! But it took a toll on my knees, along with soccer & gymnastics, but all of the above keep me moving. Glad you found something that worked for you. I really prefer not to take any kind of break from hiking but 1) I do naturally slow down in winter and 2) my feet may have other plans for me. After years of “managing” my plantar faciaitis, I have come to live with it. Tried every off-the shelf orthotic, and found the best ones to be custom orthotics made by Foot Solutions. Stretching, ice, and good hiking boots are a way of life now. This hasn’t stopped me from hiking, although my dachshund would rather be carried than hike with me! I do think this is something I will always have to manage. If not actively, then it will be something I’ll always have to keep in mind. I’m glad you found something that is working for you. I too have extreme pain from PF. Nothing I have done really takes away all the pain, but I do still walk my Doxies too. My knees now are messed up. I don’t have good insurance, so for now surgery is out. I am a widow, so I HAVE to go to work regardless of the pain. Just push through it most days. praying it will go away someday. I’m sorry, Tina. That’s a really tough position to be in. For the feet, stretching my arches using a ball similar to a tennis ball, and rolling front to back on a small frozen water bottle, really helped. Those don’t cost much either. I suffered for a few years and didn’t get relief until I used night splint boots. I found them on amazon. They stopped my toes from pointing when I sleep. A cobbler told me you can do the same thing by wearing tennis shoes to bed. I also had custom orthopedics made and cortisone shots. They did not help until I used the night splint boots. I think I paid $17-$20 bucks each. Thanks. I am not ready to go to that extreme (I think I would find sleeping with them on very difficult) but I’m happy to hear they have helped you. They’re definitely an option I will keep in mind. They did bother me when I slept so I would just wear one at a time and alternate the foot each night. I was able to tolerated one at a time. Still help to stretch out that muscle. When it is inflamed and we point our toes it shortens as we sleep. They we jump out of bed and tear it. I had lots of scar tissue. I wish I had found the night splints sooner. Frustrated that the podiatrist never suggested them. Especially as I was allergic to something in the cortisone shots. I do still wear my custom orthodics still to prevent it from becoming a problem again. I’ve hand chronic planter faciitis for years so I know the suffering. I have very high arches which is a recipe for disaster. You didn’t mention getting custom orthodics, I recommend having a least one set for your most used shoes, I also buy New Balance orthodics my podiatrists says they are almost as good. Great advice about not going barefoot, I haven’t in years, I even wear orthodic flip flops in the shower. I liked the look of your slides but because of my high arch they might not work. Check out Vionic footwear they have the best orthodic shoes, I wear their flip flops. Sounds like you are taking good care of yourself -now! I’m sorry you deal with this too. My Dad has had custom orthodics for years. That would definitely be a next step for me. For now, the insoles I am using are enough. My friend has Vionic shoes and loves them. 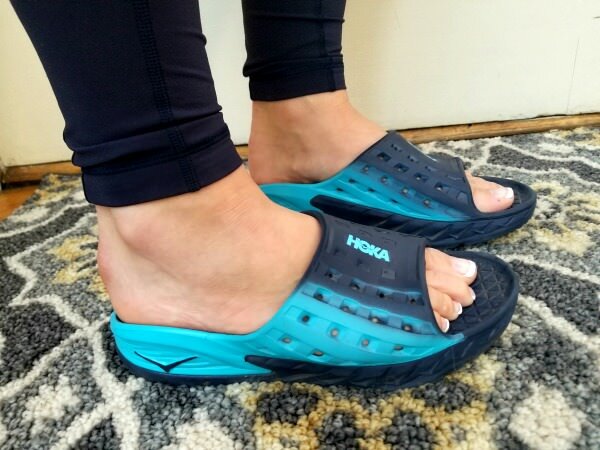 The HOKA slides are definitely not something I can wear for long periods of walking. They are soft so not quite supportive enough for my high arches. They do have quite a bit of support though and are good enough for running errands like grocery shopping. I too have plantar fasciitis (as a symptom of other foot issue) so I hear you! And like you, giving up moving wasn’t my favorite idea, though there is something to a good recovery period to let the inflammation die down. I have custom orthotics to support my arches (the highest my podiatrist has ever built or seen 🙂 ) and yes, I don’t walk even around the house without them. I also found some help in stretching/strengthening the foot and ankle, standing one-legged on the dogs’ balance disk. I haven’t heard of anyone else using that, though, so maybe that was a fluke. For me, chiropractic is part of managing my feet, but again PF is not the root cause for me, and possibly the chiro just helps to reduce the strain on the fascia. I’m glad you found a combination of things that helped you. I think using the balance disk is a good idea for strengthening foot and ankle muscles.